Leaving my adventure to achieve the last goal of my instructive voyage, IIM Amritsar is the best thing that transpired. As I achieved the entryways of my foundation, I was incredulous about myself, about this place and about the way that now I am branded forever. My whole uncertainty was gone in the initial three hours of introduction. At the point when teachers represented two hours and I wasn’t exhausted to my stun I was amazed. At that point when my companions talked and I felt there is such a long way to go. 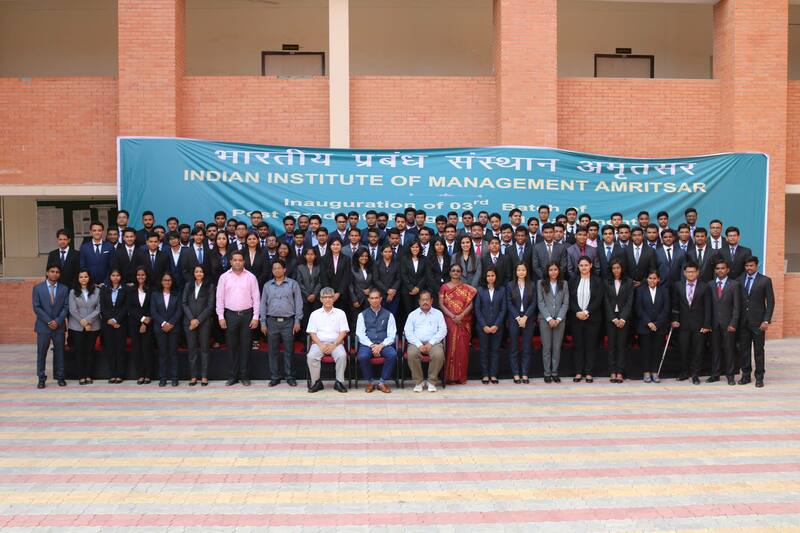 My voyage has two sections my involvement amid the 1.5 years remain here and a normal day in IIM Amritsar. Right off the bat, I might want to clarify how a run of the mill day feels here. You wake up at 7:30 and keep running for breakfast (You miss it numerous a period in the underlying days and afterward lament as the mess is best early in the day). At that point multi day-long class till 5 o clock. Faculty here are a marvellous mix of coolness with strictness if the class begins at 9, the entryway is bolted at 8:59, yet the classes are not learned, you may wind up viewing Kolaveri di in a promoting class to comprehend Viral advertising. After classes you reach the lodging by 5:45, dinner and the discourse of a fixed task make the clock demonstrate 7. After which individuals for the most part hit the gym, go for a walk or rest for some time. In the second year, half of the bunch talk about stock exchange (with incredible joy to absolute inauspicious) or genuine business issues at these occasions. Amid this time, you become more acquainted with about how CAs concentrate and how digital advertisers function, being from engineering foundation these hours gave me greatest stuns and the greatest alleviation that I am at the perfect place and I am adapting day by day. Post supper you have your group projects, singular assignments, club and committee work, reports for competitions and so on. Till the time you are finished with this clock will be somewhere close to 1 and 2. In the event that the due dates are close then it will be some place almost 3 and 4. There are occasions each week from different Interest groups. Once in a while, competition here and there converses with class banters on any point under the business sky. Some days we had classes from spiritual gurus, which gave us divine peace in this bustling field. Your days are diverse when you have a guest lecture or meetings pursued by the much-anticipated hi tea. Some time or another there will be connection and task from roll seniors, I would state this was the time we interfaced with our juniors as companions and as instructors. Amid day offs cultural committee ensure you recollect that day off or weekend till the following day away from work, each other vacation day turns into a dear journal minute here. Without a doubt because of stuffed classes, you will wind up commending the vast majority of your celebrations here however trust me celebrate festivals from around the country since we have individuals from 21 states, from Holi to Onam. Each celebration gives you opportunity to escape the day by day dress and have a ton of fun or with Halloween, to paint your faces and get shot by photography clubs. Last yet not the least is the house parties, entire night celebrating and heading off to college with no rest gives you the genuine excite. Where you move to insane tunes or you watch motion pictures in all dialects. Consistently here you learn, you gain experiences and you get worn out and knock off to rest. By and by my voyage here is an awe inspiring one simply like every other person. I joined as back fan in light of my adoration for numbers however marketing made me weak on knees and I succumbed to it. First few term was the most riotous month till date, we needed to juggle among classes and committees and clubs’ choice process. Fortunately, I got into Student Council, from that point learning through overseeing understudies, all things considered, is ideal chance. The school makes you extend your limits, being a non-athletic individual, I attempted in field occasions amid our games meet (Kritansh). I felt a similar enthusiasm in me after my middle school. I lost the race yet I felt that it is feasible for me to go past my customary range of familiarity. While I was hustling my life here the most exciting period of MBA life arrived, Summer Internship stage. I was very fortunate I got into the day zero company, so pre-placement times were an on edge period yet fortunately was brief for me. I discovered genuine joy here with my companions and in the long run with I got into the social club (Sankalp). We went to train government school understudies in the close-by town, it was inside and out an alternate point of view towards life. I wound up mindful about the truth of the nation. The following extremely close occasion to me here was the Mock Parliament occasion. It was my first time to feel that my companions are great with businesses but rather are even incredible with Policies. From Desi night to late night badminton matches, to restless submissions nights to night canteen’s Maggie, the initial two terms were one heck of a voyage. Well this institute not just made me run, it made me grow as well. My first time when I moved into the institute it was the most hectic place. After that point it was trailed by the festive term, with Kritansh finals, were it sports kept running in everybody’s blood to the melodic riddle of Strings and after that the mega occasion of Aarunya. Aarunya the college fest took our perspiration and blood. We turned out to be real world managers from this occasion. Each movement in the school in understudy run, so we are transforming into managers not in multi day but rather it is a continuous procedure. I have met the best of my companions here, seen people falling in and out of love. Figured out how to debate from a BA English Literature, found out about businesses generally from chatting with individuals who worked in that Industry, found out about the town and about abroad just by having discussions with my peers. Went to the best treks, being an entryway to the loveliest slopes, long weekends are the best things we hold up here to go from Dalhousie to Leh Ladakh. To be honest, the institute held me with open hearts and hand. I met the best teachers from whom I learned management and life. I am anticipating my final placements and waiting to spend the couple of months left at this wonderful place, my home far from home. We took part in numerous occasions, lost-won celebrated and cried. It is an all-out Bollywood spine chiller film. It’s tumultuous yet it’s the best thing. All rounder u are😘😘..keep this spark in your each work always.love.